The consciousness of humans has been on the constant rise as we get better data, science, and understanding of the ecosystem we live in. The impact on the environment by our very existence is undeniably visible to many of us today. The urgency in drastically bringing down the negative effects of the expansionism of human race is done through technology. One such boon has been the advent and application of LED illumination across homes, commercial indoor and outdoor spaces. It has not only come as an energy efficient alternative to traditional bulbs and lighting solutions, but it also offers tremendous durability, longevity, convenience, and the best of all, its very low power consumption and heat. Over the period, it saves tons and tons of wasted energy in the form of lumen inefficiency that other forms of lighting technologies are susceptible to. The applications of LED lighting solutions have been very interesting as they can be found pretty much in every modern lighting equipment, be it the tail light of a sports bike or street lighting. The environment-friendly intent of using LED lighting multiplies manifold when it is coupled with other disruptive eco-friendly energy tech like the solar power. Infrastructure development and connecting every streets and major roads across cities and towns has been the cornerstone of modernizing and developing a nation. Street-lighting is a vital part of this process as it enables movement of the human race, making trade and functioning at night possible. Street lights were also a drain on the energy supply in any area as they are required to light up a huge open space. Moreover, back in the days, more lighting directly meant more amount of wattage and wasted energy in the form of heat. Havells solves this problem with its solar-based street lights that feature state-of-the-art technologies. They offer high quality illumination for outdoor premises while helping save big on electricity bills using the power of the sun. Havells LED and solar based complete street lighting solutions can be found at railway stations, retail warehouses, panchayats, and office campuses across the country. Havells offer street lighting and mini mast solutions that can be customized, do not have the hassles of extensive and complex cabling, trenching in the ground is not required, and provide instant installation and use with ease. The Havells Enviro LED Luminaries deliver lumen efficacy of more than 105 lm/W that translates to very high brightness. The luminaires have a life of greater than 50,000 hours making then durable and maintenance-free operation for a very long period. They also have IP 66 rating that makes them rugged and enabling them to withstand harsh outdoor environment. The Havells LED street lighting systems are designed with MPPT (Maximum Power Point Tracking) which provides about 25% more charging efficiency by utilizing maximum energy harvested by solar PV modules. The highly efficient poly crystalline solar modules make the panels which are tested for longer durability and manufactured with advanced technologies. These modules are designed to withstand highly corrosive atmosphere and heavy wind loads. The modules are certified for industry standards like IEC61215, IEC61730 (safety class 1 & 11). 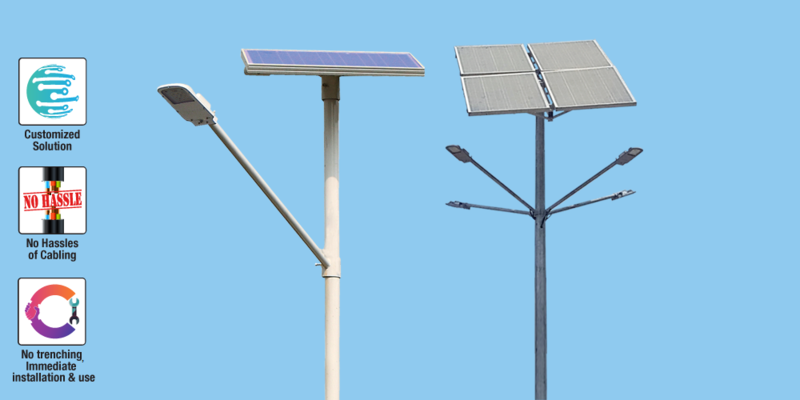 Additionally, these street lighting solutions have built-in Bluetooth connectivity, and tubular batteries to store and supply energy. The Mini Mast solutions by Havells feature all the benefits offered by the Street Lighting technology with the addition of the mini mast having a tubular octagonal pole. The mast pole is made up of high-quality composites that are durable and can be installed with ease and without the need for complex trenching. To know more about the range of Havells street lighting and mini mast solutions, click here.